The Walking Dead is a monthly comic book series. It tells the story of the travels of Rick Grimes, his family, and other survivors of a zombie apocalypse. The Walking Dead won the 2010 Eisner Award for "Best Continuing Series" at San Diego Comic-Con International. A television series, The Walking Dead was created based on the comic. It was first broadcast on AMC in 2010. The series has been translated into languages such as Portuguese and Spanish. Rick Grimes was a Atlanta police officer. After being shot by criminals, he wakes from a coma in the hospital to see that his town is overrun with walking dead people. He goes to Atlanta, Georgia to look for his wife and son. Rick finds them in a small camp near the city. The group is being led by Shane. Shane was Rick's partner as a police officer. He helped Lori and Carl get to Atlanta. After a zombie attack on the camp that caused people to be killed, Rick criticizes Shane. Shane pulls his gun on Rick, but is shot and killed by Rick’s 7-year-old son Carl. Rick, as the new leader of the group, decides the survivors need to find a better place to live. Rick’s early tries to find a place to live end very badly. A mother is killed after the survivors go into a neighborhood full of zombies. A farmer, Hershel, lets the group stay on his land. They stay there until zombies break free from his barn and kill several members of his family. Things get better when the group finds prison with fences to keep out the zombies. Rick send a message back to Hershel and his family to come join them at the prison. Rick’s group and four prisoners do what they can to make the prison safe from the zombies. One of the prisoners kills Hershel’s two youngest daughters. Rick kills another of the prisoners when they try to take control of the prison from his group. Because of many problems Rick chooses to not be the group’s leader. He is replaced by a committee. Rick and two friends, Glenn and Michonne, leave the prison when they see a helicopter crash close to the prison. They find the town of Woodbury. It is a survivor town controlled by an insane tyrant called the Governor. When Rick and his group won't tell him where they came from, the Governor locks them up. He cuts off Rick's right hand and rapes Michonne many times. The Governor lets the three escape. He hopes they can be followed back to where they came from. Before leaving, Michonne attacks the Governor. She tortures him and causes much damage to his body. The group at the prison get ready for an attack by the people from Woodbury. As time passes and there is no attack for weeks, they start to feel safe. Lori, Rick’s wife, gives birth. Glenn marries his girlfriend Maggie. The two of them “adopt” Sophia, a girl in the group whose mother died. Rick and Hershel are out in the yard looking at their vegetable garden when the Governor and a small army comes to the prison fence. The group from Woodbury have better weapons and more people but Rick's group kills many of them and they move back away from the prison. Glenn and Maggie think they will attack again. They take Sophia and leave the prison with another family. Michonne and Tyreese are caught while trying to attack Woodbury. Michonne escapes but the Governor kills Tyreese outside the prison gate. He then begins a second attack on the prison. The Governor’s forces use a tank to break down the fence. Many people in Rick's group are killed in the fighting. These include Hershel, Lori and the baby. Rick and Carl escape from the battle. Zombies move in through the broken fence. They begin to attack the Woodbury forces. One of the Woodbury soldiers shoots the Governor in the head. The people of Woodbury fight on, but there are too many zombies. Rick and Carl find Michonne and those who left the prison earlier. They soon find three people who are traveling to Washington, D.C. One of them, Eugene, says he is a government scientist. He tells them he is in radio contact with survivors in the capital. Maggie tries to kill herself after the death of her family. Rick and Abraham go out looking for supplies. Abraham is a U.S. Army sergeant who is traveling with Eugene. The two become friends when they tell each other about the killings they have had to do to survive. The group’s oldest member, Dale, is bitten by a zombie. He leaves the group in the dark to go into the forest so he can die alone. He is captured by a group of cannibals. They eat his leg before he dies. Rick and the other adults find and kill the cannibals. A reverend is the only person among them who think they way they killed the cannibals was bad. When they get near Washington, Eugene tells the group that he was actually a high school science teacher and has no contact with the government. Washington is full of zombies like other cities. A man comes to the group and tells them about a peaceful walled-off town of about 40 people. It is called the Alexandria Safe Zone. He takes them to this town. Rick is worried that the Alexandrians have forgotten how dangerous the world is. He slowly starts to not follow their rules. As town constable, he secretly carries a gun and disobeys Alexandria's leader, Douglas, to stop a domestic dispute. After the newcomers help stop an attack on Alexandria by other survivors, Douglas sees that Rick is a better leader and steps down. The gunfire during the attack causes a herd of zombies to move toward the town. They break through Alexandria’s wall and begin to kill people. The people hide in their houses while zombies fill the town. Rick, Carl and Alexandria resident Jessie try to escape the town. Jessie is killed by the walkers. When Rick and Carl are surrounded by zombies, Douglas tries to help them. 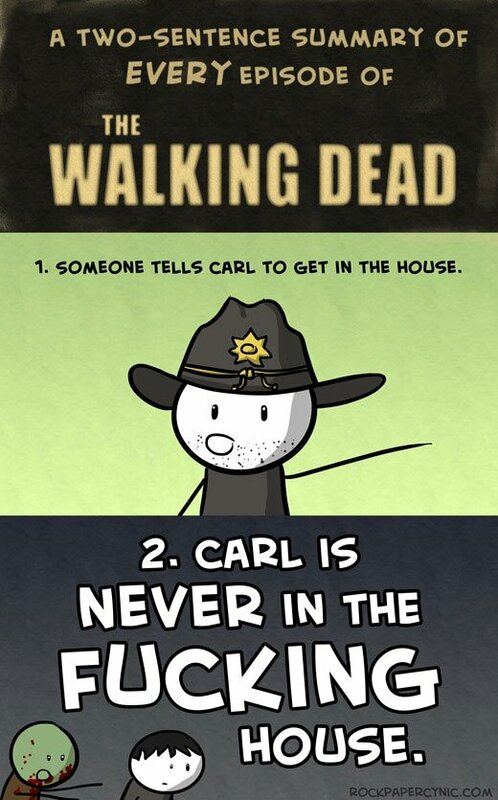 He accidentally shoots Carl in the eye before being killed. Rick carries Carl to Alexandria’s surgeon. He then goes back outside. Rick, Michonne and other residents destroy the entire herd. This shows Rick that zombies can be dealt with. He decides to rebuild civilization at Alexandria. Carl wakes from a coma but he does not remember everything that has happened over the past few years. Rick stops a small rebellion in Alexandria but forgives the rebels. Andrea tells Rick that she loves him. He does not love her back. A man named Paul soon comes to the town. He says he is from a nearby community of about 200 people. Paul wants to trade supplies with Alexandria. He tells them that he already does so with several other survivor groups in the area. Rick thinks this may be a trap and captures Paul. He gets Alexandria ready to defend against an attack. Rick soon changes his mind and decides to trade with Paul's group. He tells Andrea that Carl is in the house and asks her to watch him while he is gone. Rick then leaves with Paul and several other to go to Paul's group. Tony Moore: #1–6 (2004) (interior), #1–24 (covers) (2005), collected trade paperback volumes 1–4 (covers). Charlie Adlard: #7–present (inside), #25–present (covers), collected trade paperback volumes 5–present (covers). 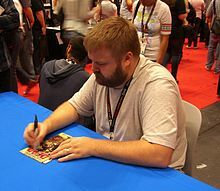 Creator Robert Kirkman signing a copy of the first issue at the 2011 New York Comic Con. The series is very well liked by critics. It won the Eisner Award for "Best Continuing Series" in 2010. Eric Sunde of IGN comics called it "one of the best monthly comics available". Max Brooks told Kirkman that he read The Walking Dead and liked it. IGN ranked Rick Grimes as the 26th Greatest Comic Book Hero of All Time in 2011. They said that Kirkman "has an endless supply of [wringers] to run Rick through." IGN ranked Michonne as the 86th Greatest Comic Book Hero of All Time the same year. It ranked the Governor as the 86th Greatest Comic Book Villain of All Time in 2009. They said that he was "a sadistic evil that The Road Warrior forgot." Wizard magazine ranked The Governor as the 131st greatest comic book character of all time. AMC picked up the rights to make a series based on the comic in 2009. It ordered a pilot episode on January 21, 2010. Filming for the series started on May 15, 2010. The series premiered on October 31, 2010. It had very high ratings. On November 8, 2010, after broadcasting two episodes, AMC wanted a second season of The Walking Dead. This season would have 13 episodes. The second season began on October 16, 2011. Frank Darabont wrote, directed and served as an executive producer until July 25th, 2011. Kirkman and Charles H. Eglee are currently writers and executive producers. AMC released an animated movie of the first part of Issue #1 of the comic. It was animated by Juice Films. The voices were done by Phil LaMarr and art by Tony Moore. On February 18, 2011, Telltale Games said they planned to make a video game based on the series. It was scheduled for the fall of 2011, but was not released until April 24th 2012. Kirkman has said that, unlike most zombie games such as Left 4 Dead, it will focus more on characterization and emotion than action. The trade paperbacks have six issues in each. They have only the story and no cover art. Each paperback has a three-word title. All hardcovers have the contents of the comics with the covers. Some have extra material. They are larger than the paperbacks. Each hardcover has two story arcs from the series. Signed versions of the books are available, each limited to 310 pieces. Limited omnibus editions have 24 issues in a slipcase with several extras. The first volume is signed by Kirkman and Adlard. There are 300 of this edition. Later volumes were released with 3000 pieces each. There is also a deluxe limited edition (signed by Kirkman/Adlard) with 300 pieces available. These are 48-issue softcover editions. The large books have over a thousand pages. They have no cover art. Compendium One was also released as a limited edition hardcover in 2012 at the Emerald City Comicon and San Diego Comicon with 1000 pieces available. ↑ The Walking Dead #1 at the Comic Book DB. Retrieved Dec 23, 2011. ↑ The Walking Dead #2 at the Comic Book DB. Retrieved Dec 23, 2011. ↑ The Walking Dead #6 at the Comic Book DB. Retrieved Dec 23, 2011. ↑ The Walking Dead #9 at the Comic Book DB Retrieved Dec 23, 2011. ↑ The Walking Dead #11 at the Comic Book DB Retrieved Dec 23, 2011. ↑ The Walking Dead #16 at the Comic Book DB. Retrieved Dec 23, 2011. ↑ The Walking Dead #19 at the Comic Book DB. Retrieved Dec 23, 2011. ↑ The Walking Dead #27 at the Comic Book DB. Retrieved Dec 23, 2011. ↑ The Walking Dead #28 at the Comic Book DB. Retrieved Dec 23, 2011. ↑ The Walking Dead #33 at the Comic Book DB. Retrieved Dec 23, 2011. ↑ The Walking Dead #39 at the Comic Book DB Retrieved Dec 23, 2011. ↑ The Walking Dead #37 at the Comic Book DB. Retrieved Dec 23, 2011. ↑ The Walking Dead #42 at the Comic Book DB. Retrieved Dec 23, 2011. ↑ The Walking Dead #44 at the Comic Book DB. Retrieved Dec 23, 2011. ↑ 19.0 19.1 The Walking Dead #45 at the Comic Book DB. Retrieved Dec 23, 2011. ↑ The Walking Dead #46 at the Comic Book DB. Retrieved Dec 23, 2011. ↑ 21.0 21.1 21.2 The Walking Dead #48 at the Comic Book DB. Retrieved Dec 23, 2011. ↑ The Walking Dead #52 at the Comic Book DB. Retrieved Dec 23, 2011. ↑ The Walking Dead #54 at the Comic Book DB. Retrieved Dec 23, 2011. ↑ The Walking Dead #62 at the Comic Book DB. Retrieved Dec 23, 2011. ↑ The Walking Dead #64 at the Comic Book DB. Retrieved Dec 23, 2011. ↑ The Walking Dead #66 at the Comic Book DB. Retrieved Dec 23, 2011. ↑ The Walking Dead #67 at the Comic Book DB. Retrieved Dec 23, 2011. ↑ The Walking Dead #73 at the Comic Book DB. Retrieved Dec 23, 2011. ↑ The Walking Dead #75 at the Comic Book DB. Retrieved Dec 23, 2011. ↑ The Walking Dead #78 at the Comic Book DB. Retrieved Dec 23, 2011. ↑ The Walking Dead #79 at the Comic Book DB. Retrieved Dec 23, 2011. ↑ The Walking Dead #81 at the Comic Book DB. Retrieved Dec 23, 2011. ↑ The Walking Dead #82 at the Comic Book DB. Retrieved Dec 23, 2011. ↑ The Walking Dead #83 at the Comic Book DB. Retrieved Dec 25 2011. ↑ The Walking Dead #84 at the Comic Book DB. Retrieved Dec 23, 2011. ↑ The Walking Dead #88 at the Comic Book DB. Retrieved Dec 23, 2011. ↑ The Walking Dead #90 at the Comic Book DB. Retrieved Dec 23, 2011. ↑ The Walking Dead #91 at the Comic Book DB. Retrieved Dec 23, 2011. ↑ The Walking Dead #92 at the Comic Book DB. Retrieved Dec 23, 2011. ↑ "Scott Pilgrim Kicks Off 2010 Eisner Awards", San Diego Comic-Con, accessed April 1, 2011. ↑ Callan, Jonathan (September 28, 2008). "Baltimore: Image Comics Panel". Comic Book Resources. Retrieved May 12, 2009. ↑ "Top 100 Comic Book Heroes. Rick Grimes is number 26". IGN. Retrieved May 7, 2011. ↑ "Top 100 Comic Book Heroes, Michonne is number 86". IGN. Retrieved May 7, 2011. ↑ "Top 100 Comic Book Villains". IGN. Retrieved September 4, 2009. ↑ "Wizard's top 200 characters. External link consists of a forum site summing up the top 200 characters of Wizard Magazine since the real site that contains the list is broken". Wizard magazine. Retrieved May 7, 2011. ↑ Andreeva, Nellie (August 12, 2009). "'The Walking Dead Comes to Television'". Geekadelphia. Retrieved August 25, 2009. ↑ "'Kirkman Talks "Walking Dead" TV'". Comic Book Resources. Retrieved 4 September 2009. ↑ "'Zombies Invade AMC as The Walking Dead Moves to Pilot'". AMC. Retrieved 21 Jan 2010. ↑ "'Walking Dead Premiere Attracts 5.3 Million Viewers'". AMC]. Retrieved 21 Jan 2010. ↑ "'Walking Dead' Gets Season 2 Premiere Date, 5-Minute Trailer (Video)". The Wrap. 22 July 2011. Retrieved 22 December 2012. "Days Gone Bye" • "Guts" • "Tell It to the Frogs" • "Vatos" • "Wildfire" • "TS-19"
"What Lies Ahead" • "Bloodletting" • "Save the Last One" • "Cherokee Rose" • "Chupacabra" • "Secrets" • "Pretty Much Dead Already" • "Nebraska" • "Triggerfinger" • "18 Miles Out" • "Judge, Jury, Executioner" • "Better Angels" • "Beside the Dying Fire"
This page was last changed on 20 March 2019, at 12:19.